I have been neglectful in acknowledging the wonderful awards and thoughts people have sent my way recently. I am not going to single anyone out in particular this round. Many of you are deserving of all of these awards, and I just cannot make up my mind who should get what. Therefore, I am taking the easy way out. Each and every one of you is a blessing, and I feel so lucky to have met you here and on your own blogs. Since I began blogging, each of you has had an impact and influenced me as a person and as a blogger. I have learned and continue to learn much from you. Your support and encouragement is greatly appreciated. Always. I have made so many great friends through the blogging community, and I look forward to our continued friendships. I just ask that you stop tempting me with all those books you keep recommending. Yeah, that's a lie. Please don't stop. I bestow the following awards on all of my faithful readers and to those whose blogs I frequent. 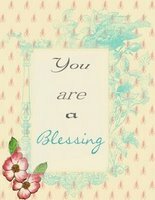 You are my blog friends and true blessings. You definitely deserve a big kiss for all you do! Thank you. BookGal from Books, Memes, and Musings was sweet enough to declare me a blessing. I appreciate it very much, and I can truly say that BookGal is a blessing to have around as well. Thank you, BookGal! RaiderGirl from An Adventure in Reading bestowed on me the Mwah Award. How great is that? Mwah, right back at you, RaiderGirl! So, the point (and I do have one) to this post is motivated by my desire to hand some of that love and kindness back around to those who have been so very, very, very good to me in this blog world. My hope is that those who receive this award will pass it on to those who have been very, very, very good to them as well. It's a big kiss, of the chaste platonic kind, from me to you with the underlying "thanks" message implied. I really do appreciate your support and your friendship and yes, your comments . . . Mwah! 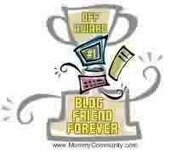 The ever generous Alice from Hello, My Name Is Alice and Melody from Melody's Reading Corner honored me with the Blog Friend Forever Award. Thank you so much, Ladies! 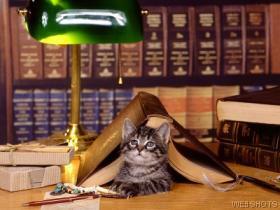 "I just ask that you stop tempting me with all those books you keep recommending. Yeah, that's a lie. Please don't stop." lol :D I know just what you mean. Thanks, Nymeth. :-) You make it so much more worthwhile for me, and I do appreciate that very much. BookGal - I wouldn't have it any other way. :-) Thank you again for the award! Congrats on all the awards, you greatly deserve them! I am so thrilled to have found your blog and gotten to know you through blogging. As for book tempting, this appears to be a year chock full of that, lol!! April - Thank you so much! It's only January and my folder for recommended books is already overflowing. This promises to be a great year for book temptation.